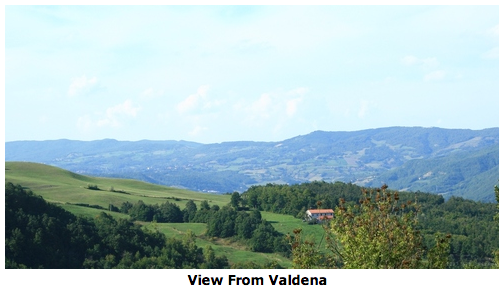 This branch of the Giulianotti family come from a village just outside of Borgotora called Valenda. the village of Valdena belongs to the municipality of Borgo Val di Taro, in the province of Parma, region Emilia-Romagna. It was here that NICODEMO GIULIANOTTI married TERESA ZANRE. Both families have much social interaction and we find brothers and sisters from both sets of family marrying. Their son Luigi married Amabile Rossi . They settled in Aberdeen and confectioners they became. They had another son Prio Tranquili Giulianotti who was born in 1912. He married Anita Berni. Another son was Gialdo Valenarde Giulianotti and he was born in 1913 in Aberdeen. He married Alice Hunter in Aberdeen Catholic Church on 26th January 1933. Santino who was born in Italy in 1917. He died in Aberdeen on 31st January 2007. Eugenio was born in Aberdeen in 1921. He died in Aberdeen on 8th May 2005. 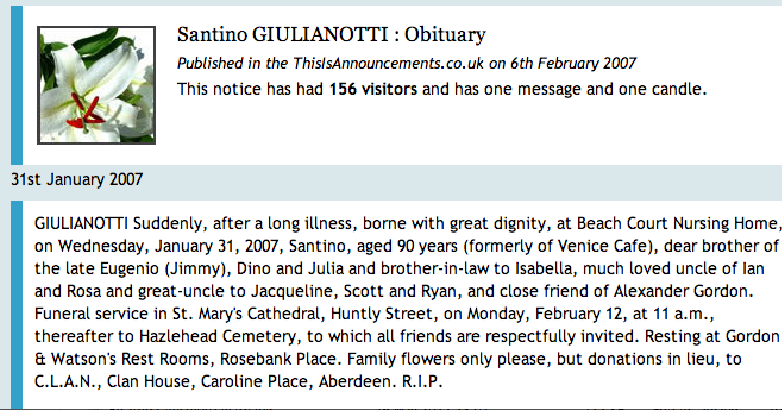 Dino was born in Aberdeen in 1924 and died in Aberdeen on 4th April 1998. Amelio was born in 1921 and died age 7 in 1928. ALLESSANDRO GIOVANI GIULIANOTTI was born on 17th May 1902 at 15 St. Andrew Street, in Aberdeen, Scotland. He married Annie Pratt. Three children, Lynda, Charles and Stella. There was also a baby Alexander William John who died on broncho-pheuonia when he was only 1 month old. The family at this time lived at Rosemount Viaduct in Aberdeen. Alessandra at this time was serving in the army in the Pioneer Corps. GIUSEPPE GILDO VITTORIA GUILIANOTTI. This boy very tragically died when he was only 1 year old of gastro enteritis. Interesting to see here that Nicodemo signed with his x mark. My husband’s great great grandparents on his mother’s Giulianotti side were Nicodemo Giulianotti and Matilde Becci. I have a few photographs of the graves taken when we visited Linda in Valdena. Is it possible to give me contact details for Lynda Giulianotti mentioned above. sorry about the delay in replying. I am trying to find contact details amongst my stuff. will send on via your e.mail as soon as I find.